Ocean King fish hunter machine ( 8 players) - King of Treasure is a 58” high definition LCD display screen with 3D graphics fish hunter machine, with 8 players control panel for 8 players acceptable at the same time and is the second English version of fish hunter series, upgrade with interchangeable guns, including the new cumulative super gun, great attractive to catch as more as valuable fish for corresponding points to win the best payout. 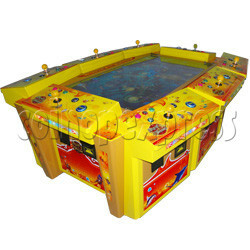 The game play comes with 3D graphic ocean theme display as an excellent video redemption arcade game, the game features a new interchangeable gun for players to enjoy. It is with simply game play, easier to any player, but also with the addition of multiple characters and featured mini games layers the game, making it challenging for older more experienced players. - Explosive Crab – catching this crab triggers a large explosion and get more points for all the fish the explosion affects. - Laser Crab – the Laser Crab acts like another weapon for the player. When they catch the crab they get one laser beam shot, which they have a limited time to aim and shoot to catch lots of fish in one shot. - Roulette Crab – previously known as Golden Reel Crab. When players capture this crab, it will begin the Golden Roulette bonus game. A golden, spinning roulette wheel will appear on the screen and players simply hit the ‘SHOOT’ button to stop the wheel and win points. The inner roulette ring scores the highest points. - Lightening Chain – when players catch a fish with Lightening Chain they can get up to nine kinds of fish at once and win extra points. There are nine types of fish which are subject to chain thunder: Fugu, Lobster, Snapper, Spearfish, Clown Fish, Octopus, Butterfly Fish, Flounder, and Lionfish. - Vortex Fish – when a player catches a fish with a Vortex feature, that fish captures all the same fish near it for the player. Each fish (except Devilfish, Shark, Killer Whales, Humpback Whales and the Crabs) has a Vortex feature. The different fish up for grabs, including: Devilfish, Lionfish, Lantern Fish, Flounder, Clown Fish, Butterfly Fish, Snapper, Fugu, Spearfish, Sea Turtle, Octopus, Shark, Saw Shark, Explosive Crab, Lobster, Humpback Whale, Killer Whale, and new characters – Laser Crab, Roulette Crab and Golden Dragon. 18 types of fish to catch and heaps of different scenes to enjoy! Notes: - quoted price for Bill Acceptor / Printer Output, if you do not need printers or bill acceptors, please contact us for a best price.